Over 7 years in the making, it's finally here! 'Live Your Life - the story of TeapotOne' DVD is an indepth look at what made me embark on this epic, life changing adventure, and how it has effected me - warts and all. With the entire trip being documented and available for free on the youtube channel at youtube.com/TeapotOneVids, I didn't want to just take the footage, make it into a DVD, then charge you money for the same thing. 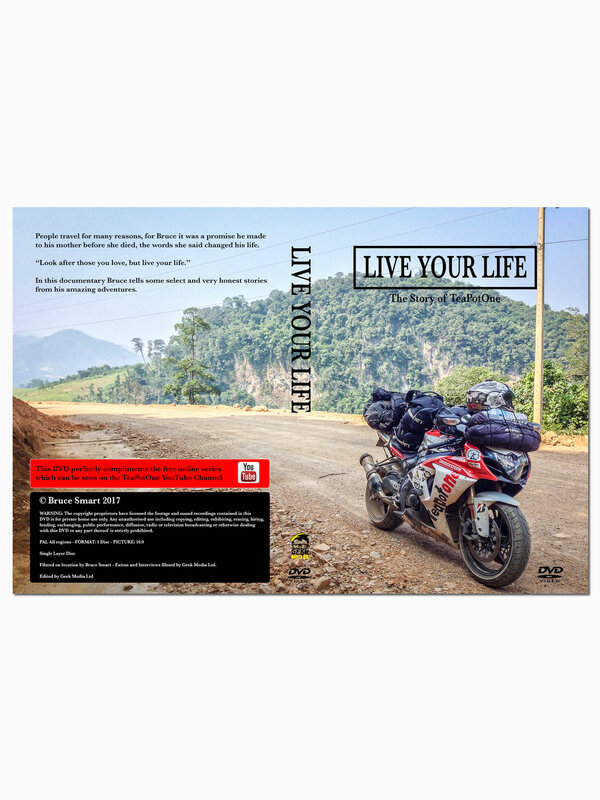 So this DVD is something special, a much more personal account of the trip, going into detail about several aspects of the adventure which people often ask about, as well as some very personal information that I've never spoken about to anyone. The DVD has been professionally edited and produced by Geek Media and they have done a spectacular job. Check out their promo for the DVD here. Really experience this amazing trip in a way few others let you share. This downloadable mp4 file is a ONE time only download and the link will expire in 24hrs. It is 1.44GB in size.